Wrapped everything up so niceleeee! 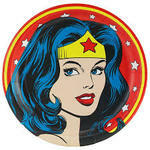 Take some photos of the gifts you have wrapped, ready for holiday giving. Use those photos of wrapped gifts on a page. 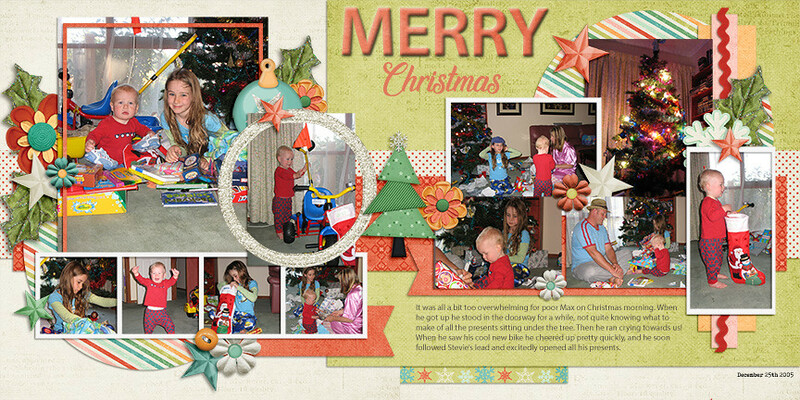 Or create a page about Unwrapping gifts, with close ups of the gift, but also the reactions of the recipients. Tell us about your wrapping process. Do you make an experience out of it, complete with Christmas music and wine or hot chocolate? Or do you balance the gifts and wrapping paper on the ironing board in the few minutes between when the washer cycle ends and the clothes finish drying? Are your packages neat with crisp corners? Artsy with cool little extra elements? Or do they look like a 2nd grader found some paper and tape? And what happens to the wrappings after the gifts are opened? Is it carefully folded and put away for another year? Do you use bags because they can be reused? What about tissue paper: saved or tossed? Do you have a story about some tradition your family follows that brings a smile--or a giggle--to you when you think of it? Is there a particular wrapping fail that you tease someone about (or about which you are teased?) 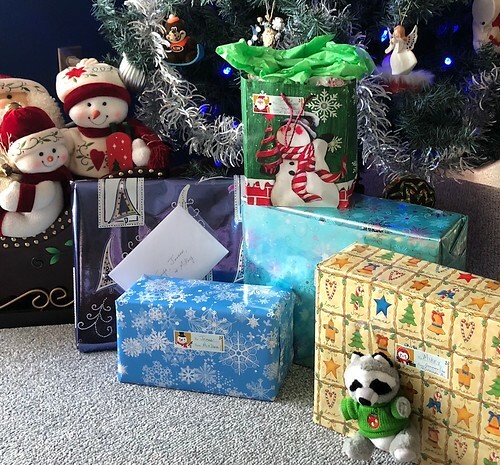 Did you as a child discover wrapped presents before Christmas Eve? What about the kids in your lives? And that's a wrap, Ladies! You have until December 30th to claim your points for these challenges. On the 31st, I will draw for the SCT magazines. i have the perfect story for this one! it is a story from this year, actually. my 19-yr-old daughter was home from college and i had been using her room as my "wrapping center" so i guess she was inspired to start wrapping her gifts. she bought my mother an awkward-shaped item and asked for my help so i found her a box it would fit in and went merrily on my way. i later saw her carrying her pile of gifts towards the tree and there was the box, in all its brown cardboard glory. i said, "you didn't wrap it?" and she looked at me like i had 3 heads and said, very defensively, "i put tape on it!" and i was like ok then. Love the story, stinkerbelle ! It reminds me of my youngest son the years he came home from college for Christmas. 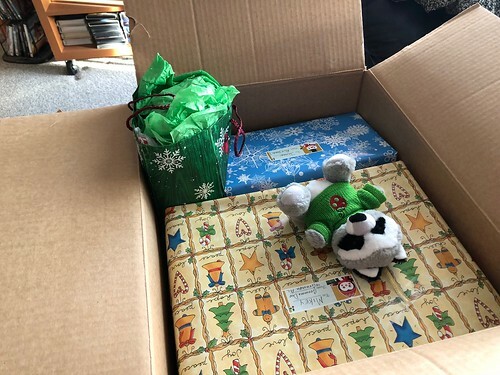 The first year, he came downstairs Christmas morning with an unwrapped cardboard box. It had a tag on it “Merry Christmas to everyone from Me!” Inside were gifts he had purchased for each of us, each with a tag for the recipient. He got quite a bit of razzing about that. 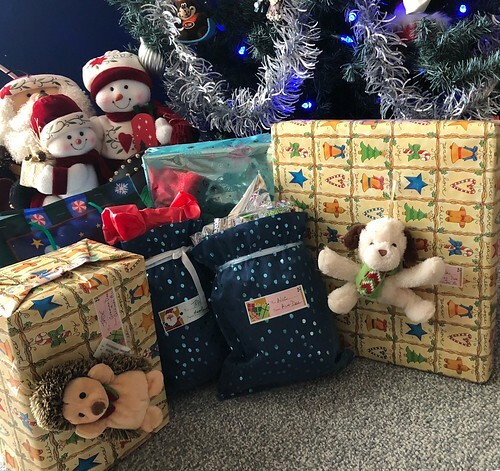 The second year, he came downstairs Christmas morning as we were starting to unwrap gifts. When his grandmother removed her gift from the gift bag, he said, “Excuse me, Baba. May I borrow that bag?” She gave it to him, he went upstairs to his room, and came down with his gift to her.in that same bag. She opened it, and he said again, “Excuse me Baba. May I borrow that bag?” One by one, he delivered gifts to each of us, each gift in that same bag! I am a utilitarian wrapper. I love, purchase, and hoard all kinds of wrapping paper, especially Christmas wrap. But when it comes to using it, I kind of whack it off the roll, quickly roll it around the gift, and tape the ends. Decorations are at a minimum, except for the stuffy ornaments for the dgk's. Here is some wrapping I have done over the past few days. A wrap already?! I forgot this was only 12 days! Those stories are great! I laughed at your son using the same bag over and over. I didn't expect him to *keep* disappearing and using the same bag. (You have to concede he had a point about reuse and waste). Funny, the Journal Your Christmas prompt for today is also wrapping paper. 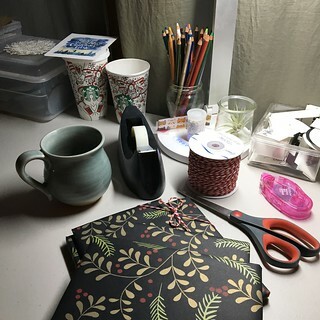 I took a photo yesterday of the wrapping I did with my morning coffee yesterday, part of my campaign to tidy up all my half-finished projects. I LOVE this black paper I got at World Market a couple of years ago. It's nice and firm so it's easy to work with. I don't do fancy wrapping but I hate the cheap paper my mother would buy that tore as you tried to make a tight corner. She would mail me gifts overseas and when I opened them the paper inside would be shredded! It does feel like a waste to use high quality paper, though, if the recipient is just going to shred it and throw it in the bin. I save paper if I can do it without being too obvious/pointed. My in laws are wasters, lol. I will happily collect up all the barely used tissue and gift bags to re-use. I have a little bag in my closet where I keep all that stuff, and I use it. This is the one time of year I wish I had a fancy Martha Stewart gift wrapping room. This year hasn't been so bad but I usually end up with a pile of gifts to wrap on the dining table and no space to stage them and no flat surface big enough to work on. Drives me barmy! Luckily I don't have to hide anything from other family members - that would be rough. 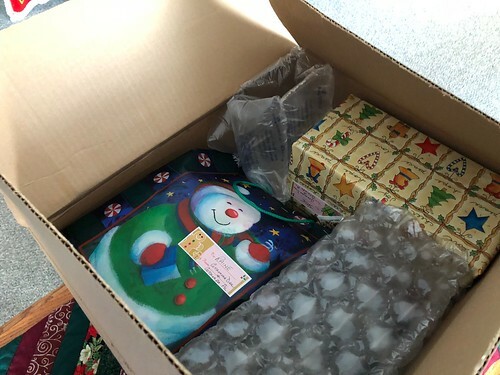 My Hawaii SIL found herself banished to a cold dusty room at her Washington state in-law's last year, surrounded by stored junk and all the gifts she'd shipped there to wrap when she arrived. Her kiddo was lonely and bored so he kept interrupting, but she couldn't let him in or he'd see all his presents. Totally miserable, so we told her to bring everything here to wrap. SO MUCH STUFF! 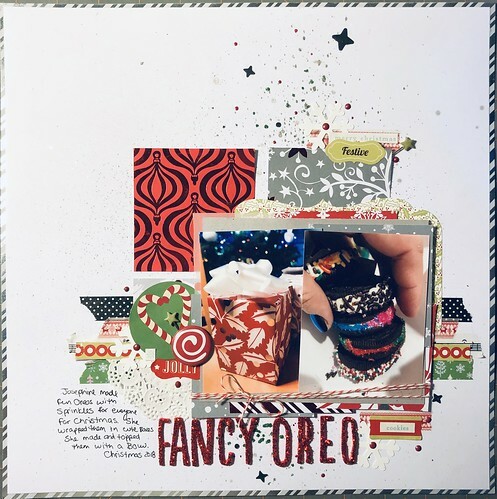 But we had a fun Xmas Eve chatting while she wrapped and I did some die cutting. Well, it's been fun, ladies! i think your presents look lovely grammadee! and your story of your son (well both stories actually) are hilarious, TFS! when i was younger, my mother made me wrap everything and then complained when i did a crummy job, so maybe that's why i dislike it so much? and she has some things this year she wants me to wrap, too! i very much enjoy watching everyone open their gifts though, whether it's something from me or not. This is a LO showing the kids unwrapping their presents. It was my son's second Christmas, but the first one where he (kinda) knew what was going on. He was 15 months old. On Christmas morning DSO went and woke him up, while I sat near the Christmas tree with my camera ready, waiting for him to run excitedly towards the tree so I could take some fun photos. Well it didn't work out quite like that, he peered around the corner and was so overwhelmed that he ran crying towards me. That's the picture on the LO of him with his arms in the air - it probably looks like he is excited but he was actually crying. 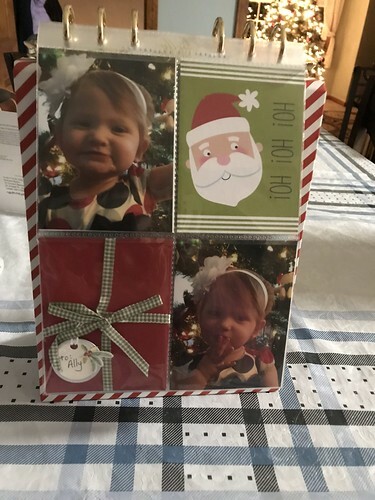 This is a layout showing the gift my daughter made for everyone in the family and a photo of the little boxes she made to wrap them. The pattern papers I used for the layout are left overs from her boxes.